WALLA WALLA, Wash.-- Peter van Oppen ’74, chair and CEO of Advanced Digital Information Corp., rang the NASDAQ Stockmarket opening bell Monday, June 12, at NASDAQ’s MarketSite in New York City. 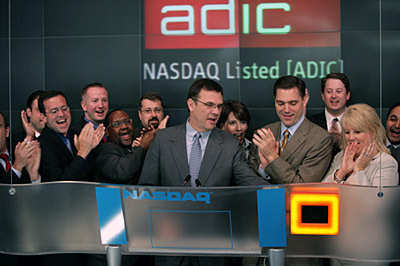 van Oppen presided over the opening bell in celebration of ADIC’s 10-year listing anniversary on NASDAQ. ADIC, of Redmond, Washington, is a leading provider of Intelligent Storage ™ solutions to the open systems marketplace. The ’74 graduate and Whitman trustee, who earned his M.B.A. at Harvard, has been CEO of ADIC since 1994.